The AAPG Annual Convention & Exhibition was opened in ACE Denver of Colorado at 6 pm on May 31th, 2015. More than 200 companies attended the meeting. Suppliers and marketing representatives from over 40 countries and regions also took part in the meeting. Technicians and consultants from Houston branch attended it. The meeting lasted for 3 days. 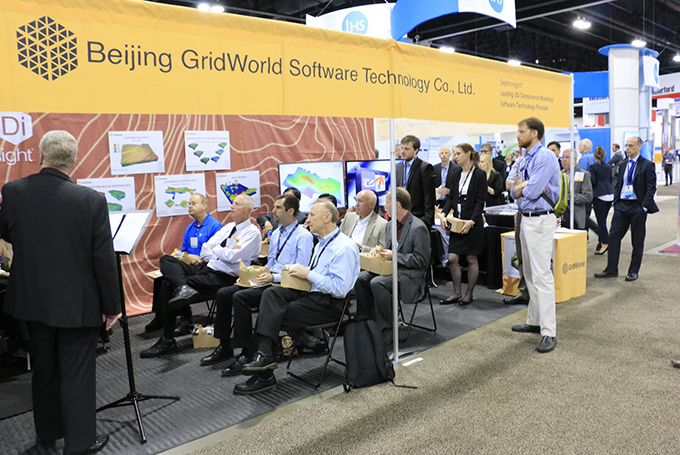 The people from the GridWorld showed the newest product, DepthInsight® 2015 Geo-modeling software. They introduced and demonstrated the three key modules, including Structural Modeling Module, Enormous Modeling Module and Geomechanics Module. The company aimed to provide a fine software and technology services for oil services companies and oil companies, and generalized a idea of SDK strategic cooperation with other software which attracted the attention of many attendees. Some of them were technicians and experts from oil service companies and oil companies such as IHS, Halliburton, Schlumberger, Baker Hughes, Roxar, Chevron, Shell and so on. Though the international oil market is depressed, it is an opportunity to show our new cost-effective technology to the oil service companies and oil companies. We wish that GridWorld would expand the international influence via this meeting and provide more and more services for workers of oil and geology industry from all over the world.